It’s Hangover Thursday, how’s your head? Have you recovered from the first round of Holiday madness yet? We are in one of my favorite times of year. I’m not a giant Christmas person, but when it starts getting cold all of those seasonal stouts and porters start coming out. So even if I haven’t been able to make it out to my local bar in a while, I’m happy to know some of my favorite beers are there waiting for me. I was born outside Detroit. Regardless of the city’s reputation, it is something I’ve always been proud of. There are a lot of things up there that I miss and some food items that I don’t just miss, but my soul is incomplete without them. Real Coney Island Hotdogs, I could talk for days about them. Kowalski hotdogs and sausage are amazing. I demand Vernors Ginger Ale every time I’m sick. Then there is the reason I’m even bring all of this up, Sanders Hot Fudge. 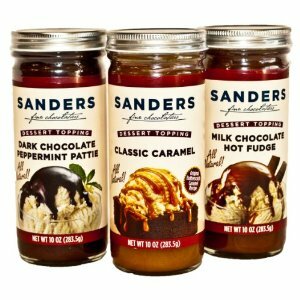 Sanders makes all sorts of wonderful things like creampuffs and cakes, but their ice cream toppings are king. So know that you know of this Motor City love deep in my heart you can understand my excitement when I stumbled upon Detroit Brewing Company’s Sanders Chocolate Stout. It was a must buy and because I found it while I was going to spend time with my family on Thanksgiving, I was hoping they’d appreciate it too. I know, you’re thinking Ken this is a lot of buildup just to talk about a beer. How was it? It was okay. I almost ended the post there. Seriously, there is a good chocolate smell. There are hints of coffee in there too, almost making this a mocha stout. It hides its alcohol taste pretty well. 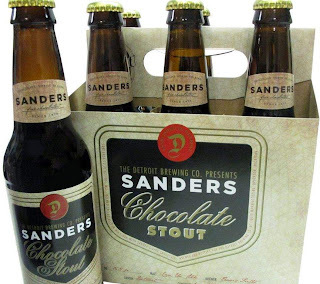 I think it would be a good beer to give someone who was just branching out to stouts. The flavor was a little more subdued than I was looking for. I’d certainly drink it again but I wouldn’t seek it out unless I knew I was going to be seeing other refugees from Hockeytown. Sorry it was a let-down, yo. It wasn't a bad beer, just an average one.